I love playing at Muse, there is always a fun card for inspiration. Kim's card is below. 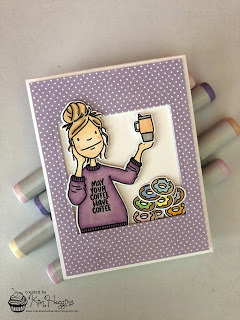 I don't have the stamp she used, but I recently got another set from Stampin Up that I think I will have a lot of fun with. My bestie just had surgery and this card is on its way to her. Here is Kim's card. I was inspired by the lady and the general encouragement of the card sentiment. Very pretty card! I do like the pink sponging in the back. This is absolutely adorable...just love your take on my card, so sweet! Thank you so much for playing along with us at Muse this week! Great interpretation, Cat! Thanks for joining us at Muse this week! 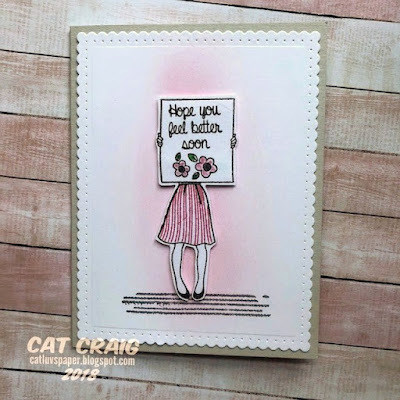 Your friend will really appreciate your darling card, Cat! btw you can come borrow my Leading Ladies - anytime! What a great image - love it! What a great stamp to use for your take on Muse Cat. Thank you for joining us at Muse this week! Wonderful take on the inspiration, Cat! I know your friend will love getting this sweet card!